It’s so good at camouflage, it wasn’t even discovered until the late 90s. Octopuses are insanely intelligent animals, and the mimic octopus (scientific name: thaumoctopus mimicus) is definitely no exception. 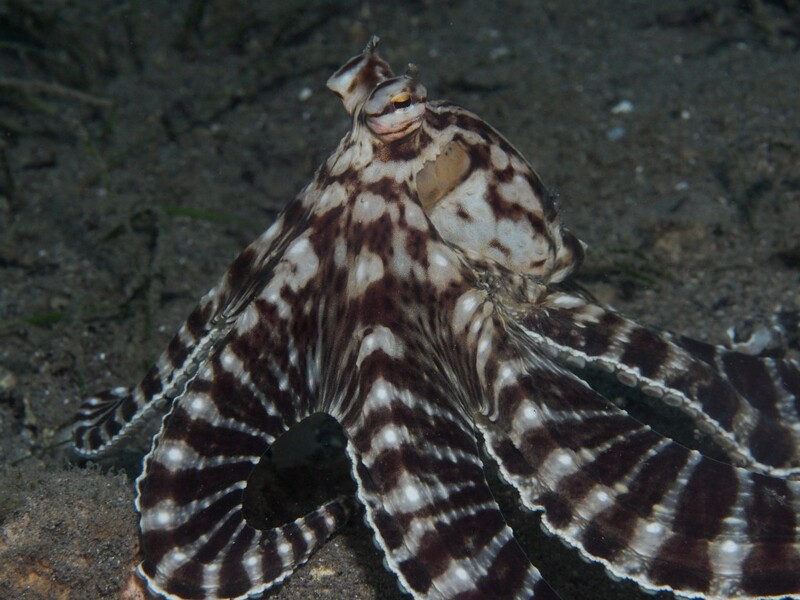 Like other octopi, the mimic octopus has pigment sacs on its skin that allow it to change its skin color and pattern to camouflage into its surroundings. But what makes the mimic octopus so incredible is that it also distorts its body and mimics the behavior and movements of other animals. Imagine being able to do that! Read on for the most fascinating facts about this wily, wild animal. 1. 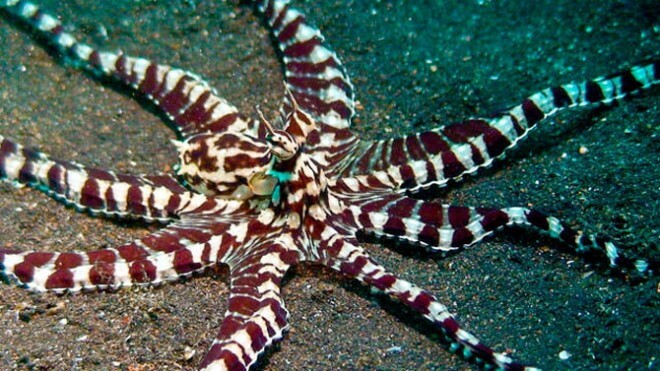 The mimic octopus was discovered fairly recently, in the late 90s off the coast of Indonesia. The rather late discovery is often attributed to the animal’s intelligence, since scientists who might have seen the mimic octopus in the wild likely assumed it was the sea animal it was impersonating. 2. The mimic octopus has been documented impersonating at least three different sea creatures. 3. It tucks its tentacles to the side and flattens its body to resemble a leaf-shaped sole (also known as a flatfish), then glides along the sea floor just as an actual sole would. 4. To impersonate a lionfish, the mimic octopus spreads its body out and swims while letting its tentacles trail from its body. 5. Finally, the mimic octopus will hide all its tentacles expect two, which it stretches out to imitate a sea snake. 6. The mimic octopus’s ability to mimic other animals is thought to be part of an evolutionary survival strategy. All the creatures it impersonates are venomous, so, while disguised, it’s less likely to be approached by a predator. 7. 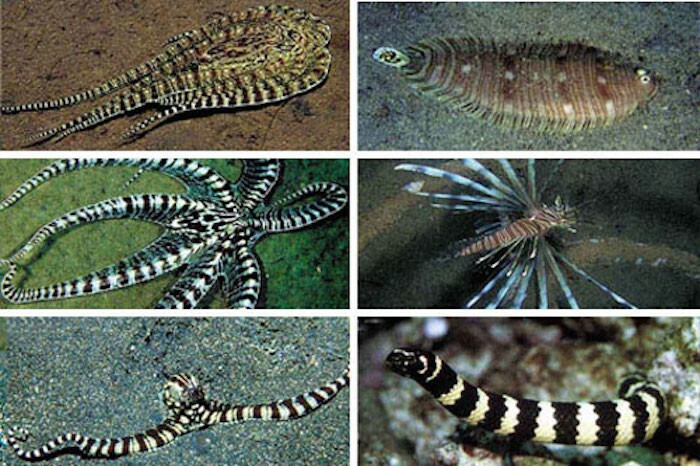 In fact, the mimic octopus will even impersonate different animals depending on the threat it’s facing. For example, the mimic will imitate a banded sea snake when it feels threatened by a damselfish. Why? Because sea snakes are natural predators of damselfish. 8. There are a few other animals that the mimic octopus has been said to imitate, such as jellyfish, anemones, starfish, etc. However, there isn’t as much evidence supporting these claims beyond a handful of photos. 9. The most fascinating claim is that someone once spotted a mimic impersonating a male giant grab in order to get the attention of a female, which it then attacked and ate. Remember, octopuses are carnivores, after all. Who Invented The Brookie, The Most Delicious Dessert On Earth?